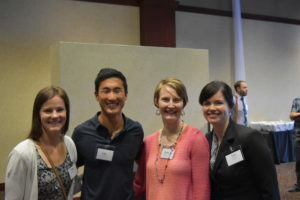 Four Gusties spontaneously connected at the Minnesota Academy of Family Physicians’ welcome event for incoming first-year residents in Family Medicine on June 11, 2017 in St. Paul: Mara Edison (’13), Lee Kenyon (’12), Dania Spies Kamp (’97) and Tara Loftus Owens (’04). Edison and Kenyon are new residents in Family Medicine at Mayo Clinic in Rochester. Kamp is a family physician in Moose Lake and the immediate past president of the MAFP and Owens is Member Engagement Director for the MAFP.